My motto this year is “Challenge Yourself.” A challenge is when you push yourself out of your comfort zone to improve or extend the quality of your life. It can be as simple as refusing pie after dinner or as awesome as running a marathon, which I still haven’t done. It is through challenge that we grow and grow we should throughout our entire lives. We challenge our students daily to try new things, to improve skills and ask questions and we should do the same. I just wanted to drop this seed in to start germinating. This weekend I intend to challenge myself both technologically and socially. I’m an old dog learning new tricks in the tech field, but I am going to just keep experimenting and see if I can get past this fear of making a mess of things and socially, I tend to be a bit shy and you don’t make new friends or learn more about old ones sitting outside the circle looking in. 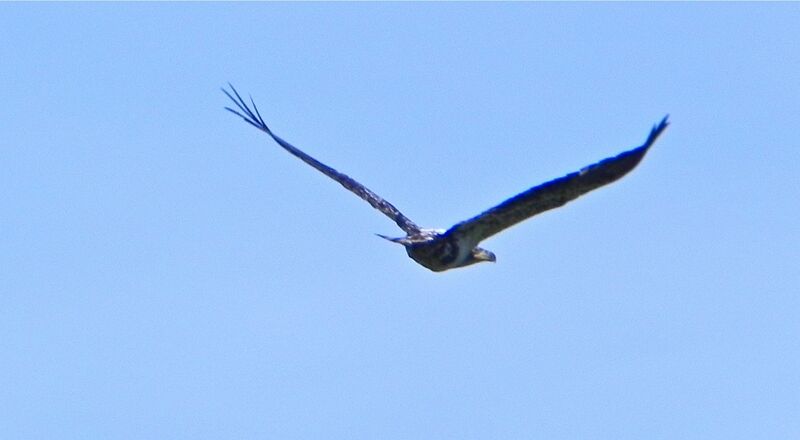 I offer you this picture of a fledgling eagle on one of its first flights that I watched out at Potters Marsh yesterday. Its mom flew underneath and pushed it up a couple of times til it got the hang of it and then it just took off on its own. If you look closely you will notice it is looking back over its shoulder at mom as it flies away.